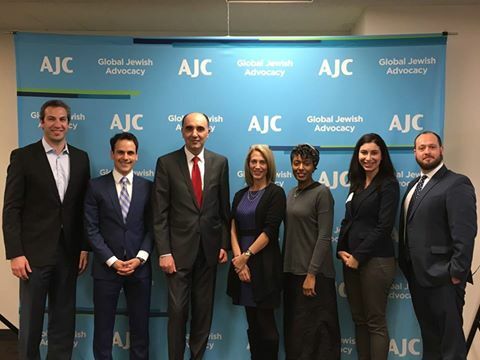 Acting Consul General Dejan Radulovic visited Global Jewish Advocacy (AJC) - Regional office in Chicago and on this occasion had a meeting with Amy Stoke, Regional Director and her associates. Amy Stoken and AJC representatives presented the work of this organization founded in 1906 and the actions taken to protect the rights of Jews around the world, suppress anti-Semitism and intolerance, and protect human rights and democratic principles. Acting Consul General Radulovic informed them about the bilateral relations between Serbia and the US, the friendly ties between the Serbian and Jewish people, Serbia's relations with Israel and the Jewish community in Serbia. He also informed AJC about the recently adopted Law on Restitution of Property, or the rectification of the consequences of seizure of property of Holocaust victims, who have no living legal heirs, in accordance with the 2009 Terezin Declaration. Acting Consul General pointed out that it is a historical and ethical act that Serbia has become the first European country to legally regulate this issue. Adoption of the law was welcomed by the US officials, Israel and the World Jewish Restitution Organization. AJC representatives expressed their gratitude to Serbia on the adoption of the law as well as the care and help to the Jewish community. They expressed hope that Serbia’s example will be followed by other countries.